This is a short, easy ride along quiet lanes and traffic-free paths with some short hills and a long descent on a stony track (good brakes needed). It is suitable for a family ride and ideally suited to hybrid bikes. All main 'A' roads are avoided but there are short sections on quieter 'B' roads. 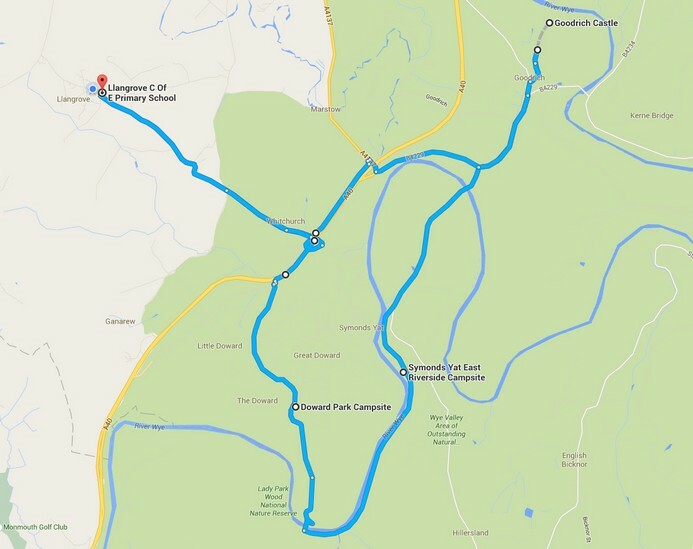 START at Llangrove C of E Academy and continue for 1.8 miles along Llangrove Road down to Whitchurch. With 'The Crown at Whitchurch' on the left and 'Woods of Whitchurch' (shop) to the right, turn right at the junction immediately prior to the A40 junctions and follow the road uphill to the bridge over the A40, signposted Symonds Yat West and NCN (National Cycle Network) route 423. After crossing the bridge over the A40, turn right following the signs to Crockers Ash, Doward and Ganarew, ignoring the NCN sign to the left (1.9 miles). Continue along this quiet lane, parallel to the busy A40 on the right. Take the first turning on the left, Sandyway Lane, just before the filling station on the right (2.3 miles). Sandyway Lane becomes increasingly narrow as it climbs steadily until opening out to the right just before meeting another lane at a T junction. Turn right then turn left at the next T junction (2.8 miles) and continue to the left up the Doward hill. In half a mile (3.3 miles total), just past the Forestry Commission sign on the left to Biblins, turn right and follow the forestry track downhill passing Doward Park Campsite on the left (3.4 miles). The track opens out to the right to a parking area featuring a local information noticeboard. 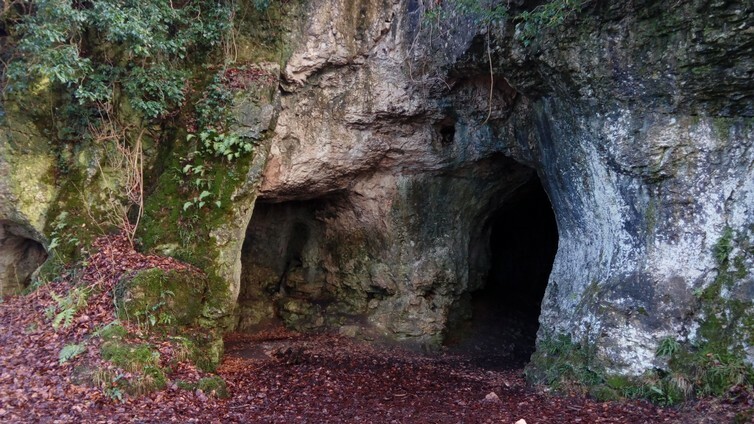 From here, a path can be followed through the forestry to Arthur's and Merlin's prehistoric caves, a relic of the Ice Age. until reaching a fork in the track at the foot (4.2 miles). Take the fork to the left signposted 'Forestry Commission - only prebooked youth groups...'. Pass the timber cabin on the right and continue down the slope to meet the footpath at Biblins camp (4.4 miles). and cross Biblins suspension bridge over the River Wye. Turn left after crossing the bridge, towards Symonds Yat East and Yat Rock (4.5 miles). The route now becomes refreshing flat, giving the brakes a well-earned break, following the earlier descent. This is the 'Peregrine Path', a designated cycle path running alongside the River Wye following the route of the former railway line between Hadnock Road, Monmouth, and Symonds Yat East. Ignore the pathway soon on the right (0.2 miles) and continue straight along the cycle path at the lower level on the left to Symonds Yat East village (5.8 miles) where refreshments, meals, ice creams, a unique man-powered rope ferry, river cruises and other activities are available along with public toilets. Leave the village (6.6 miles) and continue along the lane uphill to join the main road. Turning right leads to Yat Rock with a tough 20% gradient (to be tackled another day...) so turn left towards Goodrich following the Goodrich NCN sign. and continue along the lane to the T junction. Here you can either turn left to return to Llangrove or follow a short detour to Goodrich Castle by turning right.... Even out of season when the castle is closed, there is pedestrian acess to the parking area and for viewing the exterior of the castle. Turn right towards Goodrich and follow this short stretch of the B4229 to Goodrich. On approaching the village, take the lane on the left signposted Goodrich with the NCN cycling route, passing Goodrich Primary School on the left. Just before the post office/general store on the left (8.7 miles), take the lane on the right up to Goodrich Castle (8.8 miles) where bikes can be left in the parking area during castle opening hours. To return, retrace the route from Goodrich Castle down to the T junction opposite the general store/post office. Cross this junction then turn left to pass Goodrich Primary School now on the right. Turn right onto the B4229 and follow this road passing the lane on the left to Huntsham Bridge.